SING TO YOUR SWEETIE AT PRO AUDIO! This Valentine's Day give your sweetie the best gift ever with the bonus perk of helping TKK Give Kids SMILES For Today and HOPE For Tomorrow! Join us Sunday December 4th from 12pm to 4pm to get your style on before the holidays hit! 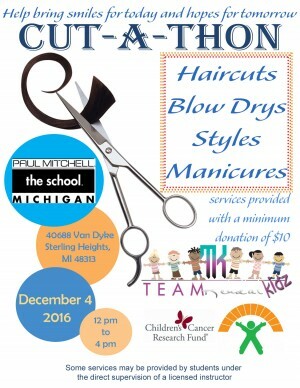 The very talented students at Paul Mitchell in Sterling Heights will be helping TKK by providing services for a minimum donation of $10. Check out their link for more info. TKK will be there selling our swag! See you all there! Thanks For helping us Give Kids SMILES For Today and HOPE For Tomorrow! A Big thank you to the Joe Kocur Foundation For Children for helping us give kids with cancer SMILES For Today and HOPE For Tomorrow. What a truly incredible organization they are and we are so grateful to be a part of this amazing family. See you all next August at the Celebrity Softball Game! It's today! Don't have your tickets yet? Don't worry you can still get them at the door. TKK will be rockin with Joe Hertler & The Rainbow Seekers If Walls Could Talk Rival Summers and Gnyp on 93.9 The River at the Royal Oak Music Theatre! Doors open at 7pm. Be there to help us Give Kids With Cancer SMILES For Today and HOPE For Tomorrow! The opening bands joining Joe Hertler & the Rainbow Seekers at our 6th Annual TKK Concert Saturday August 13th have just been announced! Please welcome If Walls Could Talk and Rival Summers. Get your tickets NOW. YOU DON'T WANT TO MISS THIS INCREDIBLE SHOW! 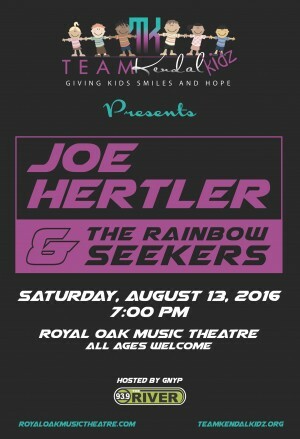 We heard you loud and clear so Saturday August 13th 2016 Joe Hertler and the Rainbow Seekers will once again be rockin' the stage at our 6th Annual Team Kendal Kidz Concert at the Royal Oak Music Theatre. Stay tuned or information to come soon! We heard you loud and clear so save the date because Joe Hertler and the Rainbow Seekers will be rockin' our stage once again this year! If you would like to SPONSOR this event please contact us at info@teamkendalkidz.org. Sponsorship packages are available. Our BWW Big Tent Event at the BWW in Howell will be here before you know it. It will be Saturday June 4th this year. Visit our events page for more details. Don't forget that our record Pin-ups will be sold at BWW in Howell and at Tony Sacco's in Hartland the entire month of May! Also our TKK Concert at the Royal Oak Music Theatre will be Saturday September 10th this year. It will be a 70's theme so dust off those disco shoes and get ready to dance! It's the most WONDERFUL TIME OF THE YEAR! It's time for our 2016 BWW Big Tent Event! We will once again be rockin' the tent with the Killer Flamingos at BWW in Howell. So mark your calendars for Saturday June 4th. This is an all day family fun event. The day will be filled with a corn hole tournament in the tent with drink specials, food, fun and raffle items on the inside! The Killer Flamingos hit the tent and 9pm! Get there early to get your spot. The live show will be 21 and over and will have a small cover charge. Save the date! 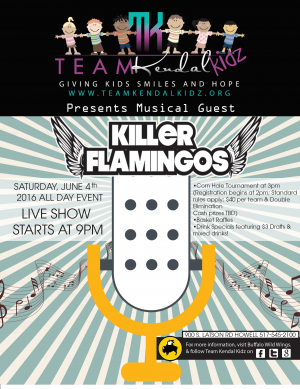 Our Buffalo Wild Wings Big Tent Event featuring the Killer Flamingos is Saturday June 4th this year! You DON'T want to miss it! As always we are looking for auction/raffle items. If interested in helping please email me at info@teamkendalkidz.org. Stay tuned -More info to come!